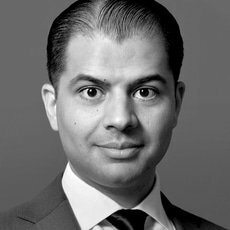 Omar Salah is a senior associate in the corporate practice group, specialising in finance, restructuring and insolvency. Some of his recent finance work includes advising on leveraged financing, asset-based financing, secured lending, syndicated loans and debt capital markets transactions. His restructuring practice covers international restructurings, cross-border insolvencies, trading in non-performing loans and distressed M&A. Before joining the corporate practice group, Omar was with the litigation practice group where he focused on Dutch Supreme Court, bankruptcy and corporate litigation and insolvency-related matters. He has significant experience with cross-border transactions, having practised law in Amsterdam, Singapore and London. From 2015 to 2018, Omar was based in the Singapore office of De Brauw where he worked on M&A transactions, international investments, multi-jurisdictional joint ventures, corporate restructurings and (Islamic) finance transactions. Previously, he was seconded to the London office of King & Spalding where he advised on Islamic finance transactions. Omar has noted expertise in Islamic finance and investments. He is a visiting professor of Islamic finance law at IE Business School in Madrid, Spain. He is also an expert member of the Sukuk Standardization Working Group of IIFM in Manama, Bahrain. Omar holds a PhD in sukuk (Islamic securities). He has been teaching, and conducting research on, Islamic finance law at various universities worldwide (among others: the University of Oxford, the University of Cambridge and the University of Melbourne) and is a frequent speaker at international conferences.